A new android defense called Google Play Protect has been launched. Google released this software to ensure it’s ever growing cell phone users are secured and to boost its several security options it has put in place to keep its smartphones safe. According to Google, whatever you do as a user on your device, you want to be guaranteed safety. Thats why Google Play Protect was christened peace of mind in the palm. Google Play Protect is basically a security for Android devices which consist of app scanning, browser protection, and anti-theft measures. 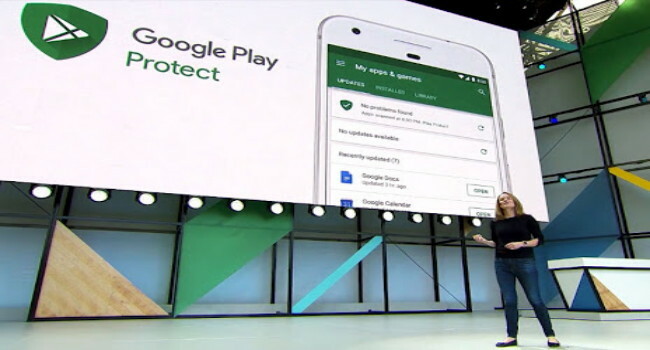 At I/O, Google has outlined some of the features in Google I/O under the security enhancements which are designed to keep you, and your devices safe. Google is also launching ‘Find My Device’ a feature in the form of an Android app that you can use to locate, ring, lock, send a message to, or erase your Android devices. This includes any Android phones, tablets, and even watches that you own. Google is rolling out Google Play Protect over the coming weeks to devices everywhere. You can play with Find My Phone right now by downloading the app from Google Play.